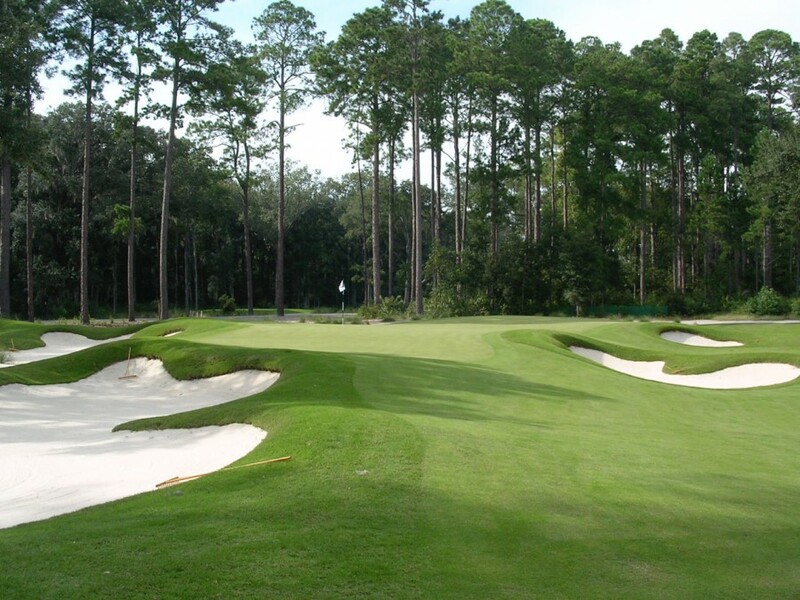 The shaping at May River’s par-4 12th green is mouthwatering. The angle into it is no joke, either, with the lines of approach complicated by two centerline bunkers back in the fairway. From the time the earliest links were staked out, whenever that was, golf course “design” has been in a continuous state of development. That’s not to say it’s been a smooth or straight evolution–there have always been stops and restarts. Pete Dye almost single handedly reset the direction of golf architecture in the mid-1960’s following the pre-fab boomer period that began after WWII, and I would argue that the opening of Pacific Dunes in 2001 marked another official schism, ending the Pete Dye era and all the excesses it came to represent. It’s no surprise that architects and design firms evolve as well. When I first saw May River at Palmetto Bluff Resort not long after it opened in 2004 I was stunned. 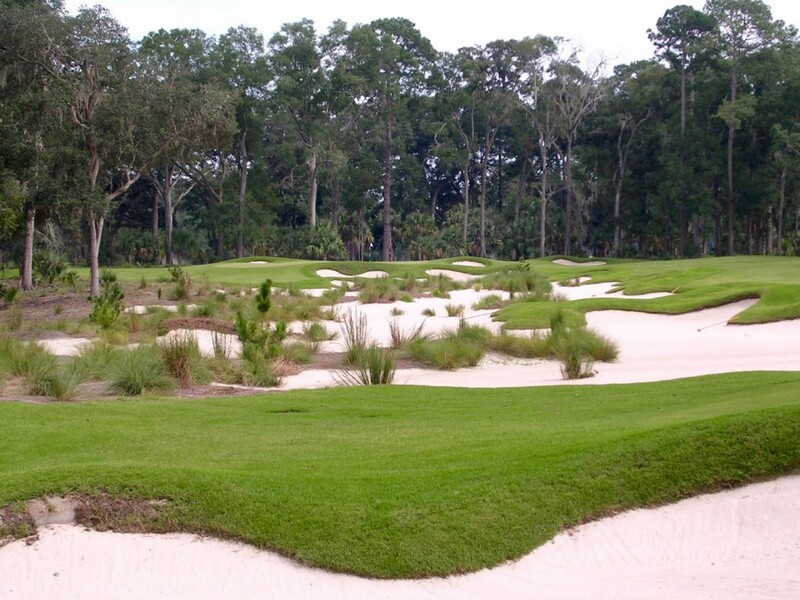 To that point my impressions of Nicklaus brand courses were the same as most everyone else’s. They were always technically and strategically engaging, they asked too much from high handicap players and often lacked a sense of grace or connection to the land. There’s a lush, composed, even naturalistic look at May River’s par-5 8th that rarely existed in Nicklaus courses from before this period. Note the go-for-it/bail out area to the left of the green. I don’t ever recall not looking forward to playing a course from Nicklaus & Co., but unless the settings were gorgeous–a Castle Pines, Great Waters, Dismal River or Mayacama–the shaping in the greens and bunkers was too often tone-deaf, ranging from highly artificial to strictly functional. May River was among a wave of designs in the early 2000’s where that changed. For reasons that are probably well documented, Nicklaus began building courses that had a more integrated look and were far more accommodating to golfers who weren’t single-digit players. The shaping became supple, the greens sat lower and the bunkers flowed into their surrounds and didn’t require high spinning, pro-caliber shots to get out. The softer, flowing aesthetic would continue at places like Dove Mountain in Arizona, Moonlight Basin in Montana, Rock Creek Resort and Cordillera Ranch in Texas, and course after course afterwards. But for me it’s most invigorating at May River. The kind of low contour and shaping seen through the final 100 yards of the par-5 10th screams playability and options…and fun. 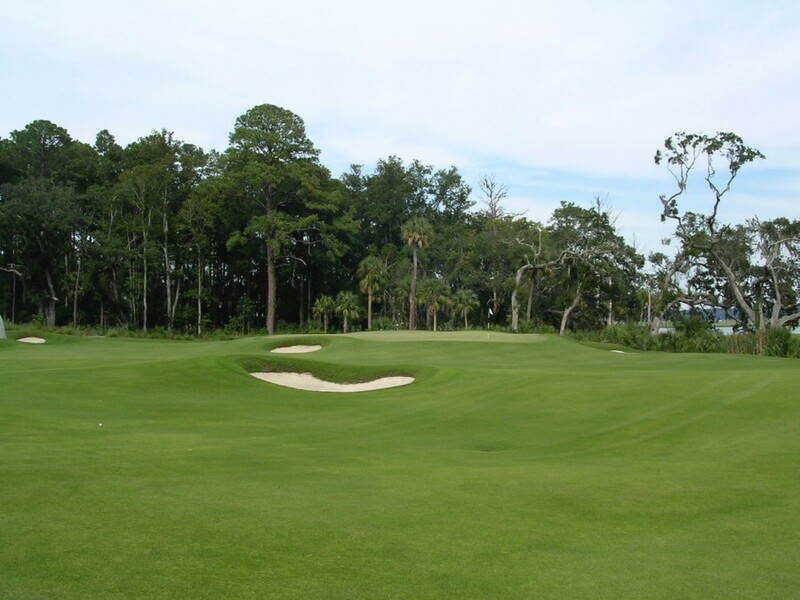 Located on the mainland across from Hilton Head Island with several holes bordering the May River and surrounding marshes, the course is 21st century Lowcountry. The expansive holes are cut through a virgin section of forest with barely any elevation change, but the rolls and shoulders and swales make the ground feel alive with movement. This is how to make a flat site stimulating, with width and shaping and holes that bend and maneuver around bunkers and natural hazards. At the 275- to 310-yard 7th a shallow green sits across a finger river marsh and accepts only a perfectly clipped wedge. The collar at the par-3 2nd green rolls off in all directions. Fairways and chipping areas around greens like the 6th, 10th and 12th and 13th sink fluidly into depressed bunkers. 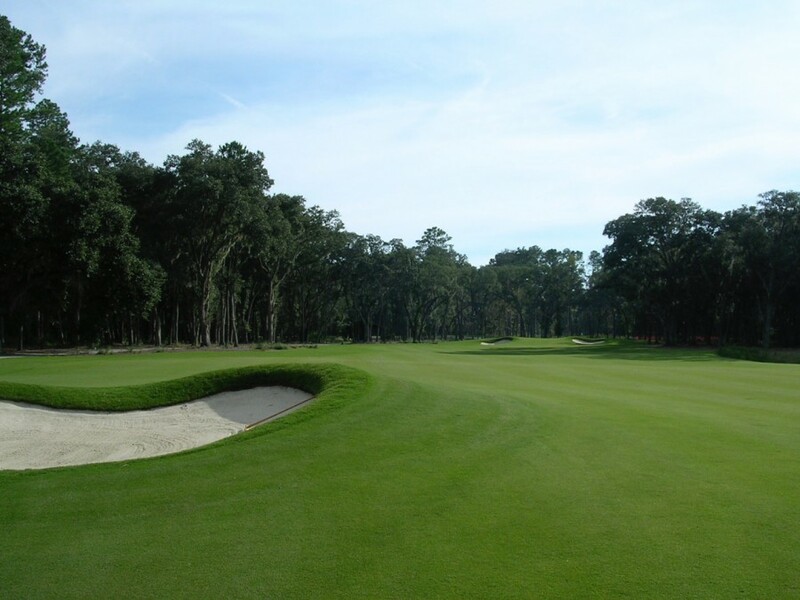 The naked putting surface at the par-5 15th is hidden 20 yards behind a saddle and two spectacle bunkers. The par-5 15th green sits beyond the two spectacle bunkers in the distance. Shots landing on the backside will shuttle forward toward the putting surface. 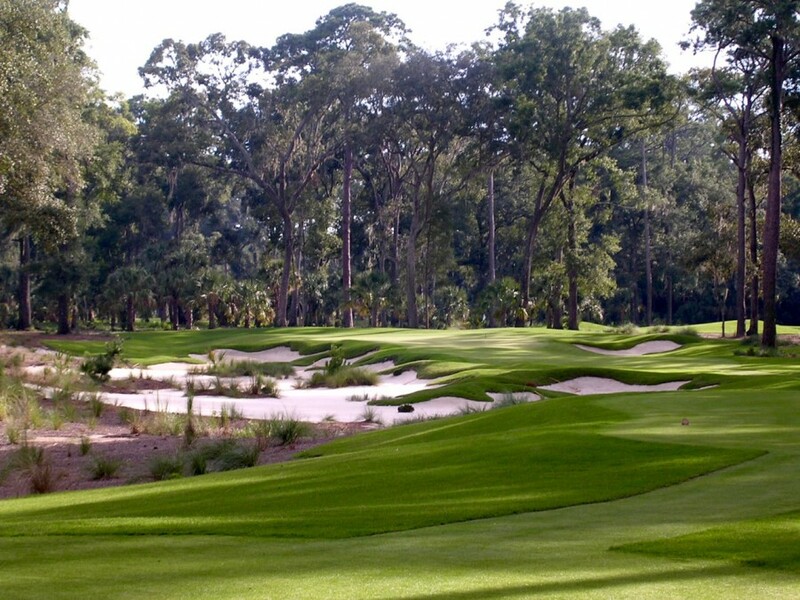 And while the roominess and voluptuous, rounded shaping would be standard Tom Fazio fare, May River is still quintessentially a Nicklaus course. There are rewards for driving it long and taking on hazards at the inside of corners. The areas around the greens are forgiving, but getting the ball close to pins on the angled greens is a right reserved for approaches played from aggressive lines. I wish golfers didn’t love water holes so much, particularly on final holes–then maybe architects would stop relying on them for closing impressions. Two lakes are out of place here at the 18th, one running up most of the left side and another fronting the green fronting the green on the right — it’s Nicklaus having spasms back to the ’90’s — but it’s not enough to spoil either the round or the great natural setting.